Start the morning with “espresso shots of intelligence”! 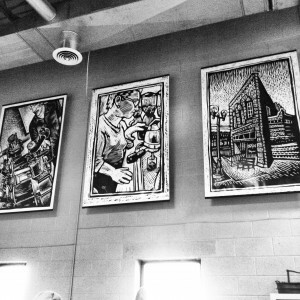 The folks at Zingerman’s Coffee Company added a bit of artistry to the walls recently. You may recognize these illustrations if you’ve been reading Part 2 of the leadership series, A Lapsed Anarchist’s Approach to Being a Better Leader. We had them enlarged for the coffee shop, and they look great! Come take a look. In the meantime, we thought we’d share an interview with our illustrators, Ian Nagy and Ryan Stiner. Ari caught up with them while writing Part 2. Here’s an excerpt from the book! Ari: I love the illustrations in the books, and I really appreciate the amazing artwork you’ve contributed to them, so I thought it might be nice for folks to get a better sense of who you are and the story behind the drawings. How did you get to Zingerman’s? Ian: Thanks, Ari. I started in 1991 as a sign maker when the only business was the Deli and became the first full- time Zingerman’s illustrator in 1997. A friend of mine who worked at “the Zing” taking sandwich orders (thanks, Vicky!) told me there was a job opening in the art department and I practically begged to work here. Before that I made art soon after birth, encouraged by my fantastic family and inspirational, art-degree-having mother. See iannagy.com for more details and stuff I’ve made. Ryan: Thanks! I’ve been here about seven years now. I started out as a part- time illustrator, but quickly started building signs and other random constructs. Now I’m a full-time illustrator and thing-maker. Otherwise, I’ve been creating stuff since I was a kid. I went for a year to the School of the Art Institute of Chicago, lived there for a few years, and then I moved to Ann Arbor. Soon after, my future wife (thanks, Lauren!) saw a flyer that Zingerman’s was hiring a part-time illustrator and the rest is history. Also, feel free to take a peek at ryanstiner.com if you are interested in more. How do you feel about getting to draw and do design for a living? Ryan: It’s pretty amazing. It can be easy to take it for granted, but when I see other artists who are in the same spot I was seven years ago, talented people who can’t do art for a living, it reminds me how amazing it is. Ian: Ryan pretty much summed it up right there, I agree with everything he said. It is the best job I have ever had and there is nothing else I would rather do. 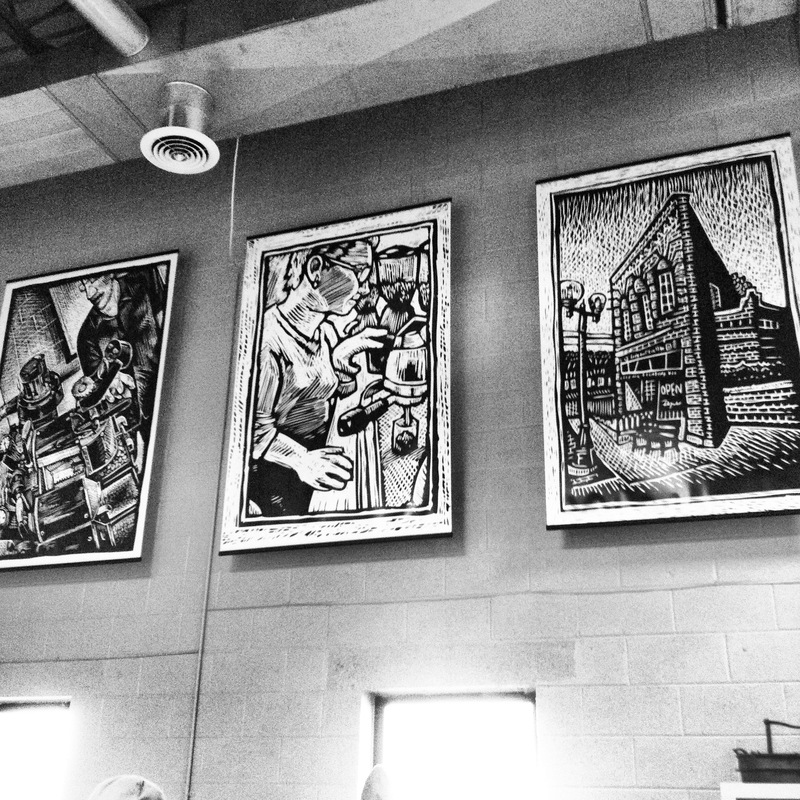 How did you decide on scratchboard drawings for the Guide to Good Leading series? Ryan: Well, you’d asked us for something in the style of woodblock printing, of the art from the ’30s and ’40s. Ian and I talked about it, and he really pushed for scratchboard. It was a way we could give you what you were looking for, and also do something special that we liked. Ian: We kicked around several different techniques but I thought scratch- board would look the best for the entire book. It’s one of my favorite ways to make pictures and I feel it is the best black-and-white medium. What’s the history of scratchboard? Where and when did it originate? Ryan: Uhmmmm, that sounds about right. The drawings look fantastic. How does the process work? Ian: After Ryan so kindly takes reference photos for us based on ideas we sketch to the scratchboard, then scratch like a maniac while touching up a few things with marker. The scratchboard we buy from an art supplies store comes pre-inked on hardboard, and we scratch it off with a small tool that looks like a tiny metal spear and fits into a basic pen-tip holder. The white part of the board that the black ink sits on is a thin layer of clay, so you have to be careful not to scratch off too much or go too deep because you will hit brown board! Ryan: I almost always hit the brown board. How long does it take to do one of these pieces? Ryan: The one I just finished today, the one with Robert Greenleaf and Emma Goldman in front of the Deli (page 258), took me about eight solid hours of artwork. Some take more than that, some are less, but that’s a good ballpark number. Ian: About a day’s work minus the photos. Ryan: There’s a certain finality to it. I mean, you can adjust a little bit after the fact. But, really, once you cut away the ink, that’s it. That isn’t necessarily there with other styles of drawing. And I like that. Plus it’s out of the ordinary. You don’t often get a request for two dozen pieces of scratch- board art! Ian: One of the things I love about it is the “noise” that you can leave in any area. For example, if you’re depicting a loaf of bread that had a black outline, you can roughly scratch the inside of the loaf. This leaves small jagged pieces of visual shrapnel, or tiny organic black and white shapes. The more you scratch, the less noise you end up with. The noise is my favorite part! I leave as much of it as I can.